It is our goal that smart building owners and operators avoid the harsh realities of cyberattacks now by taking a proactive approach towards cybersecurity. Over the past few months, there has been some well-needed government and media attention paid to the cybersecurity posture of control systems used in smart buildings and Operational Technology (OT) networks. Cyber-threat watchers note that there continues to be a significant number of these control systems that are configured in an insecure manner and exposed on the Internet. This is something that must change. Decades ago, organizations had to quickly become savvy about protecting their Information Technology (IT) networks from remote attackers. As IT networks grew, so did the cybersecurity threats — viruses, malware, and phishing attacks proliferated, and they continue to do so. Organizations that experienced early, highly publicized cyberattacks and data breaches learned painful and costly lessons. In too many of those cases, proper focus on cybersecurity awareness and best practices only happened after such an attack. Luckily, we can learn from those mistakes and lessons from the past and apply them to OT networks today. It is our goal that smart building owners and operators avoid the harsh realities of cyberattacks now by taking a proactive approach towards cybersecurity. As many of you know, Tridium’s Niagara Framework is used in OT networks around the world. A universal multi-protocol integration engine that enables applications to connect to, control, and monitor any device, regardless of manufacturer, Niagara enables integrators to build and deploy control solutions and seamlessly aggregate data from a wide variety of systems and equipment. OT experts seeking open-protocol interoperability have converged around the Niagara solutions offered by Tridium’s OEMs and integration service partners in the building automation business. Niagara is now deployed at the controller level, the supervisory level, and at the edge, and Niagara solutions are used in a wide variety of domains. As businesses use Niagara to connect more equipment, devices and people into workflows that enable data-driven buildings and industrial spaces, they can reap the benefits of comfort, energy savings and better business outcomes. At the same time, any network connectivity also brings challenges related to cybersecurity, and all stakeholders need to be aware of the fact that the target landscape for cyberattacks continues to grow and evolve. Cybersecurity is a journey that we are on with our Niagara Community. Specifically, we are on this journey with systems integrators who configure our products and facility managers and owners who oversee our products. As an integration platform, it is important that our products are securely configured. Niagara products should always be set up in an organization’s network using security best practices and a defense-in-depth approach. Once deployed, Niagara-based systems need to be kept up-to-date with the most recent security updates and patches. Systems also require continuous monitoring to detect unplanned changes in hardware or software configurations or anomalous activity that could be a sign of cyberattack. As we look at the lessons learned over the last few decades in protecting our computers and networks, practicing cybersecurity hygiene means more than deploying new technologies. Any serious effort involves the combination of people, processes and technology. Organizations need to adopt best practices and cybersecurity processes, they must deploy defensive technologies and use technology properly to defend against the threats. This type of change requires a focus on people. Behaviors related to the use of technology must change, and people in the organization need to be made aware of the threats and be trained in new cybersecurity processes. 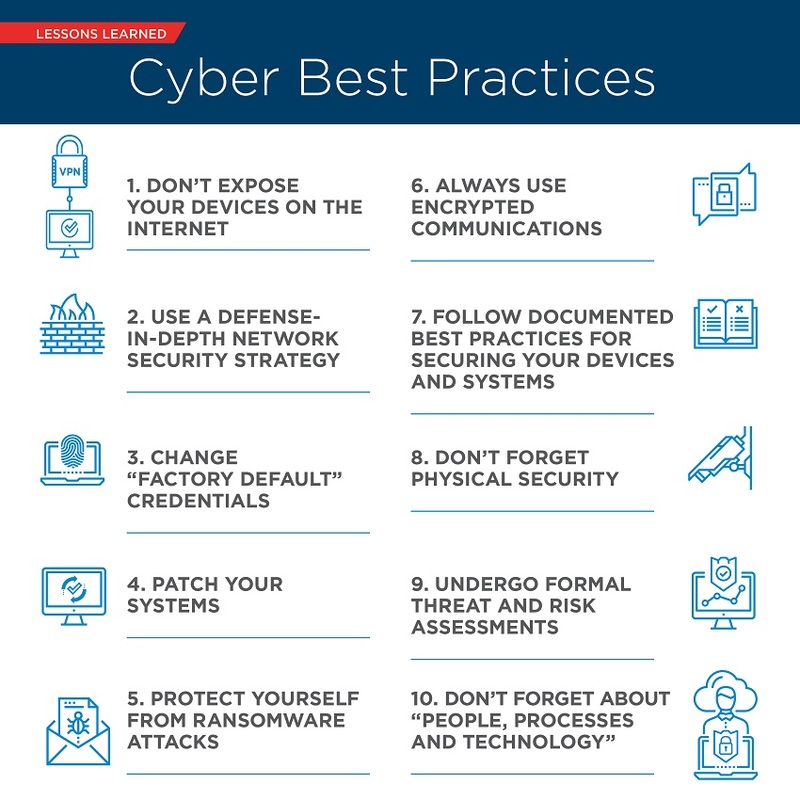 Follow the cybersecurity best practices that we provide. Tridium has released a Cybersecurity White Paper focused on best practices for cybersecurity for any organization, including specific guidance for Niagara systems. This paper provides an overview of the threats and resources for defending against those threats, as well as organizational and technical best practices. Do not expose your systems on the Internet. When any system is exposed on the Internet, it is discoverable by potential attackers and can be open to a wide range of potential attacks. We urge our customers to make certain that their systems are on networks that are configured with network security best practices, using a defense-in-depth approach. Customers should also perform periodic assessments on their systems, verifying and ensuring that those systems are not exposed on the Internet or other untrusted networks. Continue to update your systems with the most recent security updates. At Tridium, we continually release patches and security updates so that our customers’ systems can be updated with the most recent versions. To be protected, it is critical that those updates be applied as soon as is practical. Conduct periodic assessments of your systems to ensure they are up-to-date with the latest patches and cybersecurity updates. Use our Niagara Hardening Guides to securely configure Niagara systems. Tridium has released security hardening guides for our AX products and our Niagara 4 family of products that include step-by-step instructions on best practices aimed at securing our products (available on our website HERE and also HERE). Use our other available online resources. In addition to the Cybersecurity White Paper, there is a TridiumTalk webinar focused on cybersecurity available on our website and a keynote presentation available on Tridium’s YouTube channel. Cybersecurity is a partnership: we all have a role to play. At Tridium, we see Cybersecurity as a top priority, and we are dedicated to continuously improving the security posture of our products and providing guidance to Niagara systems integrators, business partners, and facility managers. We want to work together with you in this cybersecurity partnership, and we will continue to update you as we release new security features, enhancements, and updates. Kevin T. Smith is the Chief Technology Officer of Tridium. The author of 7 technology books on the subjects of cybersecurity, semantic interoperability, and software engineering, he is a frequent speaker at industry conferences on various topics, including a focus on cybersecurity and building control systems. Tridium is a world leader in business application frameworks, advancing open data environments and easy interoperability. Our Niagara Framework® universal multi-protocol integration engine has fundamentally changed the way people connect and control devices and systems., Tridium delivers Niagara software and the JACE® controller and server platform through an open distribution business model with open protocol support. With almost one million instances worldwide, Niagara is helping a significant number of businesses, manufacturing enterprises and government entities improve performance and reduce energy, operating and other costs, and be more strategic and competitive. The Niagara Community is a large and active community of innovative developers, integrators, consultants, manufacturers, resellers and end users who use Niagara daily. Tridium is an independent business entity of Honeywell International Inc.